Above: Santa Fe artist Frank Buffalo Hyde explores charged issues in bright, playful images. He’s sitting with his paints in the back room of Studio Central, a studio/gallery space in the Santa Fe Railyard that he shares with his wife, the ceramist and painter Courtney M. Leonard. The front room is stocked with everyday items transformed into Native art (or vice versa): her mugs painted with abstract splashes of color and images of skateboarders, his T-shirts printed with ironic buffalo and tepees in what he calls “Miami Vice pink.” The door leading back to the studio is open, inviting visitors to wander in on Hyde while he works on a painting of a live buffalo trapped between lettuce and an oleaginous slice of cheese, burgerized. Courtney M. Leonard and other artists. The backroom studio invites casual visits. Subverting stereotypes is Hyde’s stock in trade. 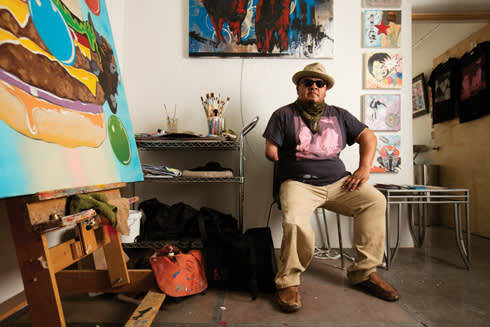 Born at the old Santa Fe Indian Hospital in 1974, he’s part of a generation of what he calls “Native art mutts,” kids of mixed tribal origins whose parents met at the Institute of American Indian Arts. Like many of his peers, Hyde grew up sensitive to how Native Americans are represented outside their communities, and came to admire the painters Fritz Scholder and T. C. Cannon, who poked fun at the pop mythos of the Indian. But his path to picking up their torch was a roundabout one. He acknowledges his recent candy-colored stencil paintings’ debt to Warhol, Lichtenstein, and other midcentury pop-art giants. It’s a natural reference point for work that critiques the commercialization of culture—in the case of Hyde’s targets, the cheap appropriation of Native symbols and imagery. He’s painted Gwen Stefani wearing feathers and fringed buckskin, from a painfully misguided No Doubt video, along with portraits of Picasso in a headdress. And, yeah, he’s painted a whole herd’s worth of buffalo. As a symbol, the animal roams the fraught space between indigenous culture and United States history where Hyde has made his home. He and Leonard have supported each other’s art ever since their first date, which began on the steps of the National Museum of the American Indian in Manhattan. Now that they share a work space, they try to involve other artists they admire. Studio Central’s coLAB series features canvases shared between Hyde, Leonard, and friends like Jamison Chas Banks and Cannupa Hanska Luger. Rather than look over one another’s shoulders, an artist will start a piece in private and pass it to others to do what they want with it, exquisite-corpse style. Hyde hopes to host other kinds of creative collaboration as well, possibly with the help of MAKE Santa Fe, where Leonard is on the board. —Contributor John Muller wrote about the legendary fly-fishing guide Taylor Streit in the June issue. Spend a day exploring Santa Fe’s three major museums dedicated to Native art. On Museum Hill, the Wheelwright Museum has a Jicarilla Apache exhibition (505-982-4636; wheelwright.org), while the Museum of Indian Arts and Culture goes pop with Into the Future: Culture Power in Native American Art (505-476-1269; indianartsandculture.org). IAIA’s downtown Museum of Contemporary Native Arts opens a Rick Bartow retrospective on Friday, Aug. 19 (888-922-4242; iaia.edu/iaia-museum-of-contemporary-native-arts). Explore dozens of local galleries with a Native bent, including Blue Rain Gallery, home to many of Indian Market’s biggest names (505-954-9902; blueraingallery.com), and Niman Fine Art, owned by the family of Dan Namingha (505-988-5091; namingha.com). Studio Central is in the Santa Fe Railyard at 508 Camino de la Familia, behind REI. Open by appointment (505-974-6122; studiocentralsantafe.com). Hyde’s work is also shown at Tansey Contemporary on Canyon Road (505-995-8513; tanseycontemporary.com).